Are we that hopeless against the invasive water hyacinth? I refuse to give up . – Mohammed Hersi . A hotelier who is passionate about Tourism & Governance in Africa. It is my pleasure to welcome you to my blog. Are we that hopeless against the invasive water hyacinth? I refuse to give up . I write this post on a sad note . 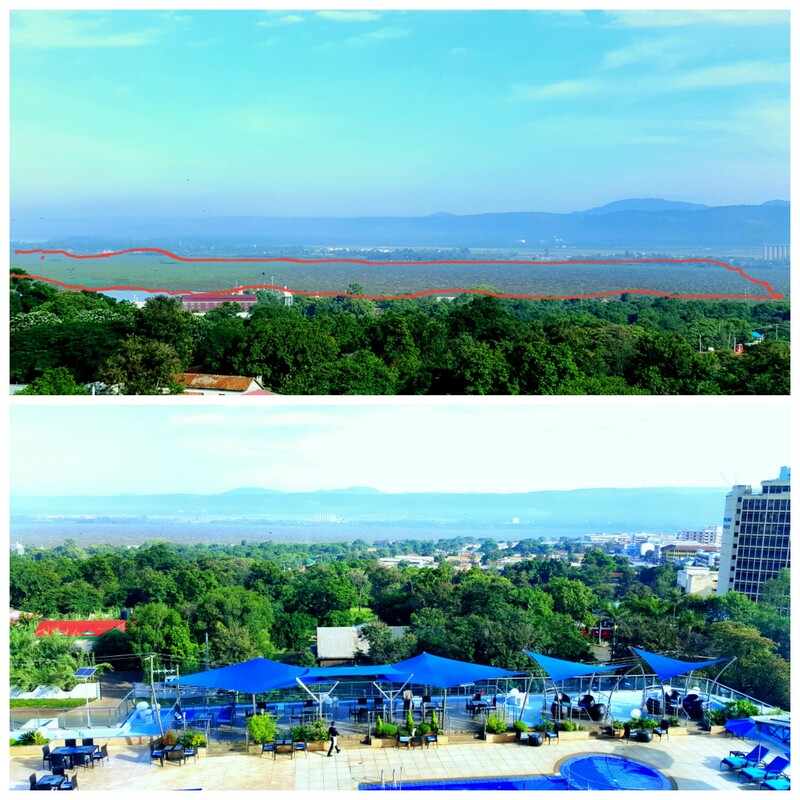 My hotel room at Acacia Premier hotel is supposed to have a great view of Lake Victoria ( its not really about my view ) Sadly the lake is no longer visible thanks to water hyacinth that has rendered the lake almost pretty useless. The area I have marked in red is supposed to be a beautiful mass of water now all covered by the notorious invasive water hyacinth. Hyacinth menace is not only in Kenya. How have the rest of the world dealt with it? It can be harvested and it can be mechanically destroyed. As a lover of matters environment we must do something. Lake Victoria is the source of River Nile and all the counties that fight for use of Nile should get concerned. One time Egypt was ready to go to war if any country attempted to interfere with flow of the Nile, where are they now? Where is IGAD ? Both national and county goverments must have this top on their agenda besides Lake Victoria is considered a future source of water for good part of Kenya.. I personally refuse to accept that hyacinth has defeated us. Man is intelligent enough to deal with such and I believe we have what it takes to eradicate it. As always I choose ro remain an optimist that this matter will be addressed with both urgency and the importance it deserves. Previous PostJunior Stars Kenya & Watoto Soccer Awards Mombasa is seeking for support !!! Next PostAccidents, What’s the use to travel at night to save a few hours?